The fiercest Slave revolt outbreak, before Spartacus, was known as the Second Sicilian Slave War (104-100 BC). Publius Licinius Nerva, governor of Sicily, in accordance with a Senatorial order that no citizen of an allied state could be kept as a slave in a Roman province, set free a number of Sicilian slaves. However, he ceased the emancipations after raising expectations, creating major unrest. Athenion led a slave rebellion in the west, resulting in the Battle of Lilybaeum. Meanwhile, other slaves also revolted and elected Salvius as their king. In order to prevent internecine slave fighting, Athenion deferred to Salvius’ authority and became his general. Their combined armies were said to number 20,000 foot and 2,000 horse. Salvius defeated the forces of Nerva and the rebellion spread throughout all of Sicily. The Roman Senate dispatched the Praetor Lucius Lucullus to Sicily with 1,600 reinforcements and he incorporated the remnants of Nerva’s army into his own. Salvius and Lucullus met near Scirthaea. During the battle, Athenion achieved miracles with the rebel cavalry until he was wounded and left for dead. 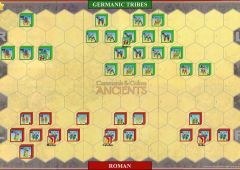 The Romans then won the battle, and massacred most of the slaves rather than take prisoners. For partisan political reasons, Lucullus did not exploit his victory to hunt down the last of the slave rebels, but left a simmering rebellion to his successor C. Servilius, who proved to be incompetent. Thus the rebellion continued until 100 BC. Optional set-up. This Roman Army was still organized along pre-Marian guidelines. 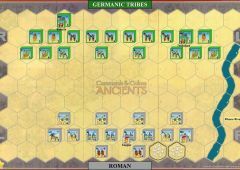 If the Roman player desires, he may use the gray Roman blocks from the basic game when placing his units. HERE you can also find a log file from a two years ago game with David Andrew. 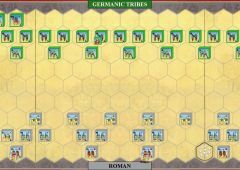 Slave army (me) started with some aggressive attack on Roman Left side (Medium Cavalry, Warriors and Leader) and supported them with a Double Time card in the center, letting some more Warriors, Medium Infantry and Leader to advance. 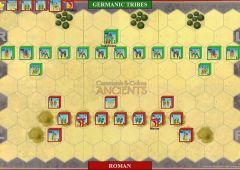 Romans reacted with a perfectly played "Line Command card" reestablishing the battle outcome with a partial result of Slave 4 - Romans 4. Slaves tried one last "charge" with Cavalry, but only managed to get 5th vicroty points. At this time Romans (with a perfectly suited "Order Medium" card) crushed away the Slave Army. It's been really close and enjoying. 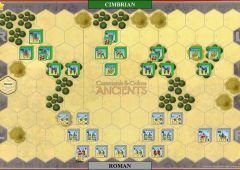 I've just uploaded a Log File about Schirtaea scenario played vs CJ (slave army). After an initial manoeuver and skirmish phase with some arrows... the two armies met on the Roman left flank with a group of 4 units advancing with their Slave leader. 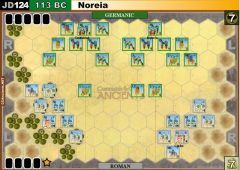 Light Roman infantry managed to survive the attack, even if suffering the most. 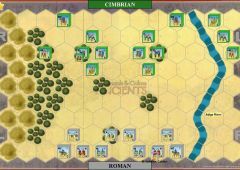 Romans reacted with Medium Troops and gained first 2 Victory points. 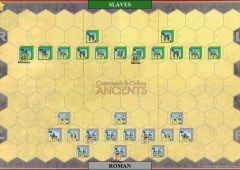 Slave army tried to outflank romans but without success, losing the support of his medium cavalry and his entire right flank. Befor the end game slave army managed to catch an unsupported MC with 1 block left... and finally got his Victory Point.